It is no secret that my family loves anything and everything Star Wars. Our boys have seen all six Star Wars movies countless times and they never get tired of watching them. But one thing they have never experienced is seeing any of the Star Wars live action films on the big screen. There is just something completely different about seeing a movie in theaters, even if you have already seen it a million times at home. So when I heard that Episode 1 The Phantom Menace was being released in 3D in theaters this month, I immediately became excited for my boys. Now they could watch Darth Maul battle Obi Wan and Qui Gon on the big screen and now in 3D! My son and I had the privilege of watching an advance screening of the movie when we were in San Francisco at the amazing press junket over the weekend. He was a little disappointed at first when he realized it was not a new Darth Maul movie, but that quickly vanished once the movie started and the characters came to life in front of his 3D glasses. "Mommy, with these glasses on its like everything is right in front of me!" He was genuinely thrilled with it and really enjoyed being able to watch one of his favorite movies in the theater for the first time. 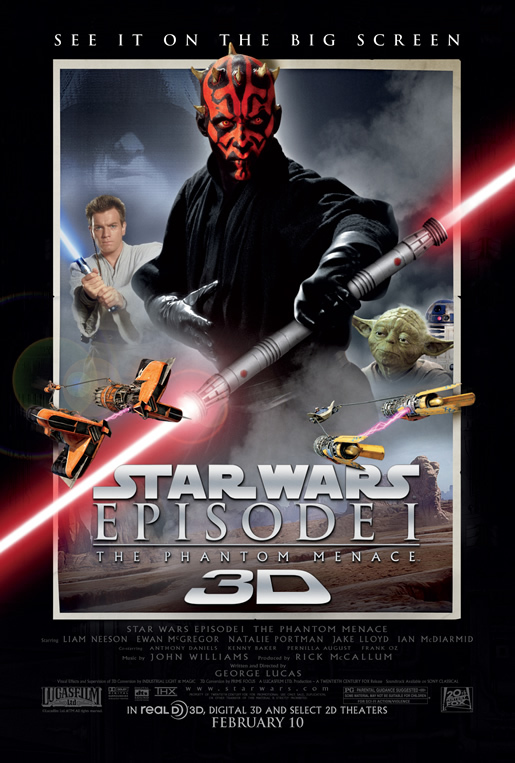 Even if your child has already seen this at home, I highly recommend that you take them to the theater to see Star Wars: Episode 1 The Phantom Menace in 3D. They will love it all over again!